15 year old Jorem was brought in with multiple, painful body swellings that started from his left foot and then spread all over his. He was assessed and admitted for a biopsy to rule out suspicion of cancer. His medical bills was met by compassionate fund as their family is generally poor and have already sold everything they could to visit various health facilities trying to get the right treatment. 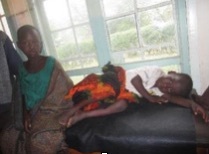 Christopher Amolo , a boy of 7 years old, was rushed to Kumi Hospital from one of the schools in Ngora, with severe anaemia, severe malaria. He was vomiting, had diarrhoea and a high fever causing a series of convulsions. Assessment was done by medical personnel in Kumi Hospital and appropriate treatment was given, including a blood transfusion. After a week he improved and was discharged. 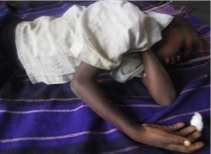 Ezra Okwii, a 4 year old boy, fell down from a tree as he was playing in his village, fracturing his arm. As his family circumstances are desperate, he is staying with relatives as his parents have both disappeared, there was a problem paying his bills. He was taken to Atutur Government Hospital where he was referred to Kumi Hospital for management. On assessment by our Orthopaedic Surgeons, he was planned for surgical intervention. He was discharged after improving to come back for review after 4 weeks. 4 year old Ezra was involved in a road traffic accident in his village of Kachonga in Bukedea District, where he was knocked over by a speeding motor vehicle, killing his mother on the spot . Ezra and his sister were fortunate enough to survive. Ezra was rushed to Kumi Hospital in a coma. Emergency attention was given and after 4 days in the ward, he was discharged. The families of these children would like to extend their gratitude for the Compassionate Fund through which their medical expenses could be paid.